Rochelle Jake, 45, says she thought the Indian Health Service should be responsible for her health care, not Obamacare. 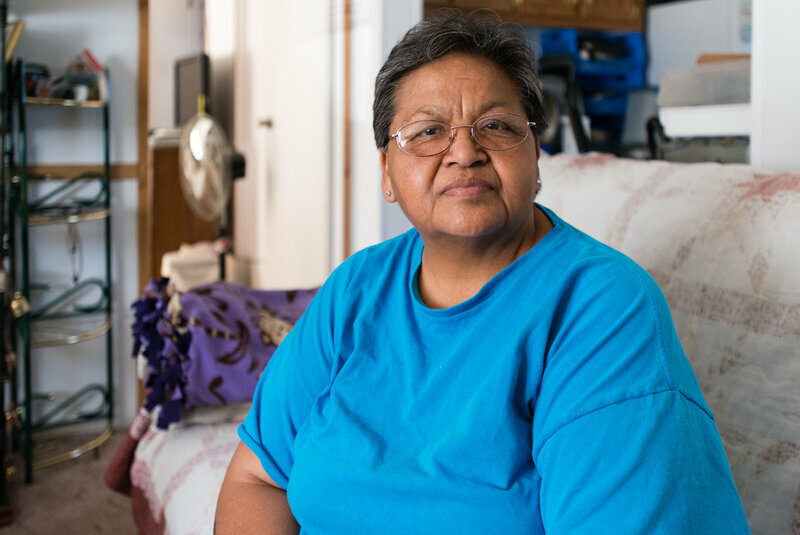 As a member of the Navajo tribe, Rochelle Jake has received free care through the Indian Health Service her entire life. The IHS clinics took care of her asthma, allergies and eczema — chronic problems, nothing urgent. Recently, though, she felt sharp pains in her side. Her doctor recommended an MRI and other tests she couldn't get through IHS. To pay for them, he urged her to sign up for private insurance under the Affordable Care Act. "I couldn't wrap my head around it," says Jake, 45, sitting on the porch swing of her home in Albuquerque. She didn't think Obamacare applied to her. "I thought [IHS] should be responsible for my health care because I am Native American." But Jake did sign up for a plan and now can start making doctors' appointments. Tribes, health care advocates and government officials across the nation are working to enroll as many Native Americans as possible in Obamacare, saying it offers new choices to patients and financial relief for struggling Indian hospitals and clinics. Native Americans can get an exemption from the requirement that everybody have health insurance. Under the health law, however, many Native Americans can get coverage under Medicaid, which serves low-income Americans, or buy subsidized plans through insurance exchanges. That allows them to receive treatment from private doctors and hospitals rather than rely solely on government and tribal facilities. And the coverage allows Indian health facilities, which tribal leaders say are chronically underfunded, to bill insurers for care they already provide. And that additional revenue means doctors and hospitals can also offer new services. Advocates also see the health law as a chance to reduce the health disparities that have long afflicted Native Americans, including rates of diabetes that are three times higher than the U.S. population and a life span that is four years shorter. "The Affordable Care Act is starting to fill the gap between need and current resources," says Doneg McDonough, a consultant to tribes on implementation of the health law. "And it is a huge gap that has to be filled in." The Indian Health Service provides care to about 2.2 million American Indians and Alaska Natives in 35 states. But the federal agency, with a fixed budget of $4.6 billion, can't afford to provide comprehensive services at all its far-flung facilities. "I don't know if you guys have all heard of this saying, 'Don't get sick after June because IHS runs out of funding in June?' " enrollment worker Shaina Ramone tells a crowd at a Navajo agricultural business near Farmington, N.M. "So don't get sick in July or August." 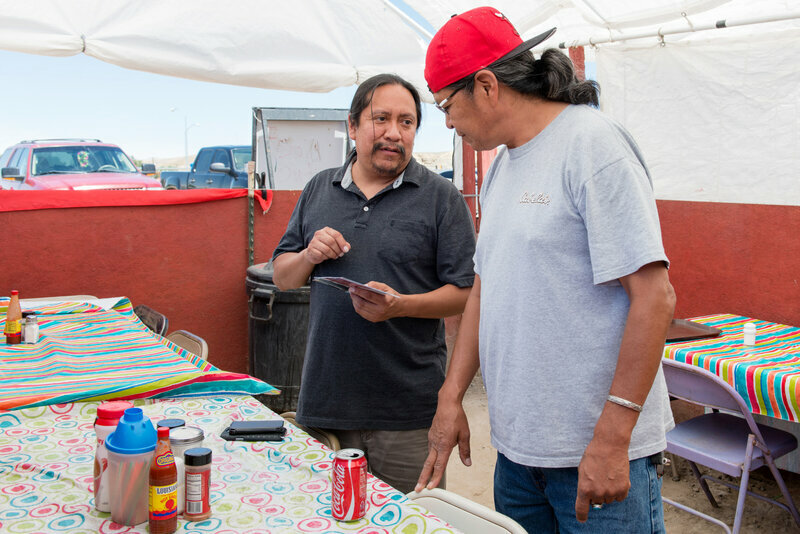 Outreach coordinator Sonny Weahkee (left) talks with a restaurant customer about health insurance for Native Americans in Shiprock, N.M., in early August. 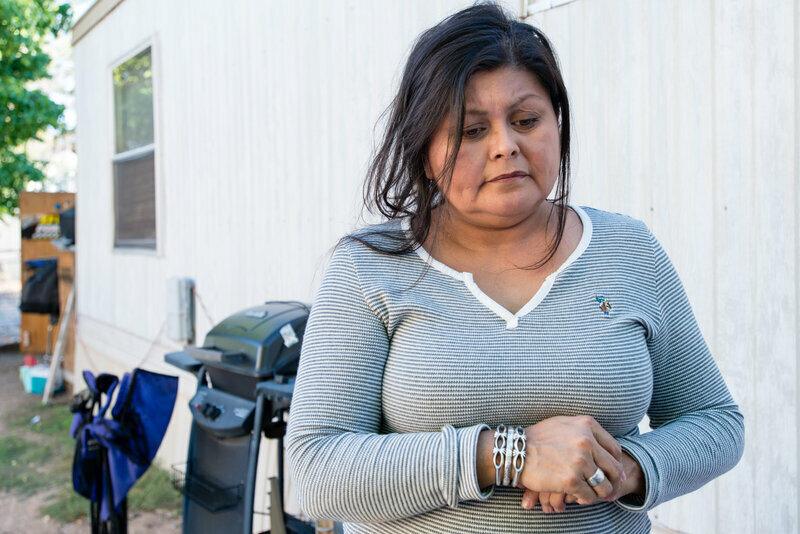 Enrollment workers have an uphill battle, however, because many Native Americans are unfamiliar with the law and insurance or mistrust the government. "We are just now starting to scratch the surface," said Sonny Weahkee, outreach coordinator for Native American Professional Parent Resources, which has a contract with New Mexico to do outreach and enrollment among Native communities. "Insurance has always been available to other people, but it is brand new for us." Weahkee wears his hair in a long ponytail and greets friends with a hug. His job is to travel across the state to talk to Native Americans about Obamacare. His organization persuaded Jake, despite her initial reluctance, to enroll in a plan through New Mexico's exchange that costs her about $37 a month. Enrollment counselor Shaina Ramone makes her pitch at a laundromat in Farmington, N.M. Native Americans in federally recognized tribes can sign up year-round. Weahkee, who is part Navajo and part Pueblo, meets one on one with potential enrollees where they work and live, answering questions and promoting the benefits of insurance. At a traditional tribal feast in Santo Domingo, a small pueblo about 45 minutes from Albuquerque, Weahkee stands in front of a shaded table, handing out brochures and fans with the logo of the New Mexico exchange. The next day, he travels to the hilltop Navajo reservation in Shiprock, where he talks to customers at busy grocery store and a small restaurant where a handwritten menu features mutton stew, Navajo burger and fry bread. Weahkee also likes to visit laundromats, where people have time to spare. No reliable estimates exist on the total number of Native Americans who have enrolled in Obamacare. But tribal officials say Indian health facilities and contractors are already reaping the benefits. In fiscal year 2014, the Indian Health Service collected $49 million more in revenue because of patients newly insured through the Affordable Care Act, according to the agency. In New Mexico, Leonard Thomas, acting IHS director for the Albuquerque region, says the money is helping modernize aging facilities and add medical staff. Thomas says the IHS can now pay for more services, such as diagnostic tests and orthopedic care from outside facilities. Brian Garretson, director of patient financial services for the San Juan Regional Medical Center, a nonprofit community hospital in Farmington, is more than willing to lend space to outreach workers to sign up new enrollees. His hospital contracts with IHS to provide care to Native Americans, but Garretson says the hospital can't always recoup the cost from the agency. "There are times when we get to the end of their fiscal year, and they have already gone through all their money so we aren't going to get paid," he says. At the Zuni Comprehensive Health Center on a reservation west of Albuquerque, CEO Jean Othole says she's enthusiastic about the future. With added revenue, she plans to expand the number of exam rooms throughout the hospital. Still, Othole says the hospital struggles to recruit doctors, and patients have to leave for surgeries and most emergency and specialty care. That includes women who need C-sections or who face high-risk births. The health law so far is having an uneven impact on Native Americans and health centers that serve them. Not all states chose to expand Medicaid. And because of the way the law defines Native American, only certain tribal members are entitled to special benefits such as a restriction on out-of-pocket costs like copays and deductibles. Some people are more receptive to health insurance than others. Galen Martinez, a teacher who lives on the Acoma pueblo west of Albuquerque, doesn't plan to sign up. As he cooks chicken wings at a tribal ceremony in Gallup, Martinez says the U.S. government should provide comprehensive, free health care to Native Americans, as promised. Insurance doesn't solve the problem, he says, because even if you have it, getting from remote reservations to cities for care is burdensome. Margaret Thompson, 59, who has arthritis and diabetes, signed up for a private plan through the New Mexico exchange for herself and her husband. The tax credits cover the $811 monthly premium. Weahkee and his team say that is part of their challenge. Along with signing Native Americans up for insurance, they also must also teach them how to use it. They recently helped enroll 59-year-old Margaret Thompson in an exchange plan. It was the first time the Navajo woman had been insured. Sitting at an outreach office in Farmington, Thompson says now she's nervous about seeking out private doctors to treat her arthritis and diabetes. She's used to the Indian Health Service. "I don't know where to begin," she says. Tidak ada artikel lain dengan kategori serupa.